Sometimes things are just crazy. Did you ever feel that you were underwater and every few minutes you are allowed to surface for a gulp of air? That has been my life for a whole month. But I have to say -- it's all good! This piece of art is from the Fancy Folds and Motion Paper Crafts CD. Called a Pop-out Tunnel Card, it is surprising easy to make, and is really cool when the recipient opens it and the greeting or image pops out. 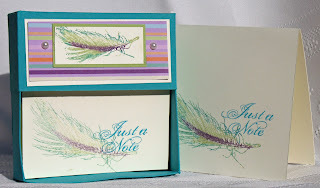 All of the stamps and paper on this project are from Stampin' Up!. The Fancy Folds and Motion Paper Crafts CD was launched this past month -- and received very successfully. At $17.95, the CD contains 60 pdf step-by-step pictorial/tutorials -- pictures for each step -- and it has been a hit with Technique Junkie subscribers and non-subscribers alike. If you have not already done so, you can click on the link above to order it. On November 5th -- which, in come to think of it, was over a week ago -- Donna Duquette and I hit the road and exhibited at the Greater New York Stamp and Scrapbook show. Poor Donna...not only did she have to put up with me on the ride from Connecticut to Long Island with me chattering in her ear, but the car I was driving broke down, too! It added an extra 2-1/2 hours to the day. Donna should be sainted! What a crazy day it was. We did have fun, though, and met a ton of people. Donna did a million - nay, perhaps a billion -- demos of one of the upcoming December techniques. I can assure you (based on the reception from people at the show) that you will love this technique when it comes out. Donna's newly developed Carpal Tunnel syndrome is testament to that! Thank you, Donna, for smooshing your heart out! Many thanks to Mary Garvey and Dee Ruger -- both of them did booth time and helped out with set-up and during the show hours. Thank you both! Okay, enough blathering on. Just thought I would share a bit of life from planet Junkie! I love this little notecard holder. I made the box with one peice of paper and scraps of designer paper. Then I made quick little notecards with some white paper...isn't this a great gift idea? I think I will be making a version of this to have on hand as an extra little holiday gift item. Just a little something extra -- and it is virtually no effort to make. And yes, of course it is on the Fancy Folds and Motion Paper Crafts CD. If you have ordered yours, know that it is being printed right now -- and I will have them in the mail to you within a week! If you still need to order it, you can do it HERE, or order with renewal HERE or order with a new subscription HERE. Lots of options for you! I used a retired Stampin' Up! 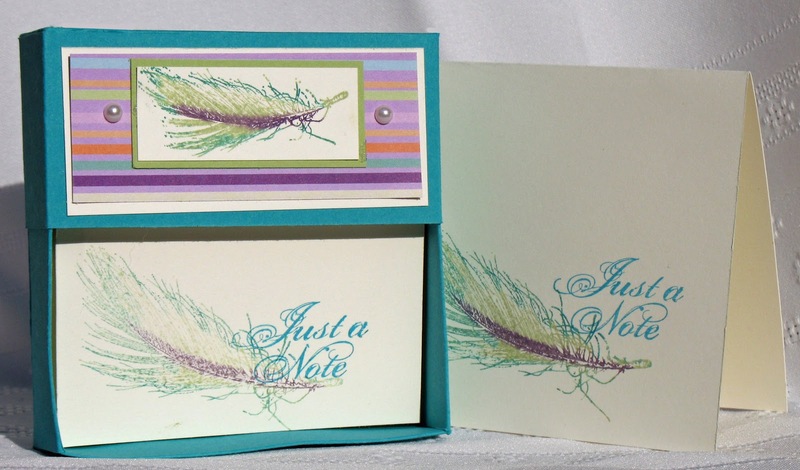 Greeting stamp with a Feather from Fred Mullett Jr to decorate my box and cards. Oh -- the box lies flat, of course. I just have it standing on edge so you can see it better!